Butler, PA, August 27, 2018 — Joey’s P.A.W. has helped over 60 special needs dogs have a better quality of life since the founding of the organization in August 2017. Over the past year, 58 dogs have been outfitted with wheelchairs, five dogs have received custom prosthetics and six dogs have been adopted. “All dogs, especially those that have suffered from abuse or neglect, deserve to be happy and healthy. We want these dogs to be adopted into their forever homes. We strive to educate people about the charm of special needs dogs and make it easier for potential owners to adopt by providing these dogs with a prosthetic or wheelchair. We feel fortunate to have already helped over 60 dogs have a better life,” said Tanya Diable, President and Founder of Joey’s P.A.W. Tanya and her husband Charlie Diable founded the nonprofit after caring for Ella Grace, a paralyzed puppy who was wheelchair bound, and adopting Joey, an abused, maimed dog who has a prosthetic leg and had been on an adoption list for almost a year. 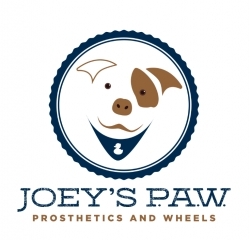 This past winter, a special needs dog named Boone, who uses a wheelchair due to his previous owner’s abuse, became an ambassador of Joey’s P.A.W. Boone is educating the public about the joys of owning a special needs dog and is currently in a pilot program working to become a therapy dog. Follow Boone’s story on Instagram @a.miracle.named.Boone. Joey’s P.A.W. will be having a holiday fundraiser on November 29, 2018, from 5:30 – 8:00 p.m. at North Park Lounge in Cranberry Township, PA. To attend, donate items, or volunteer, please email Tanya at [email protected] To support Joey’s P.A.W. through a donation, sponsorship, or as a volunteer, visit JoeysPAW.org/. Founded in 2017, Joey’s P.A.W. is a 501c3 nonprofit organization that seeks to help dogs whose quality of life has been altered by abuse, neglect or medical illness that inhibits their ability to walk or run freely. The organization is committed to fitting dogs with prosthetics and wheelchairs (P.A.W. ), aiding in adoption, and changing people’s perception of special needs dogs through education. For more information about Joey’s P.A.W., visit JoeysPAW.org/. Note to editors: For more information, news and perspectives from Joey’s P.A.W. journalists and analysts may call 724-290-6683. Web links, telephone numbers and titles were correct at time of publication but may have changed.